Are we already up to this point in the strip? 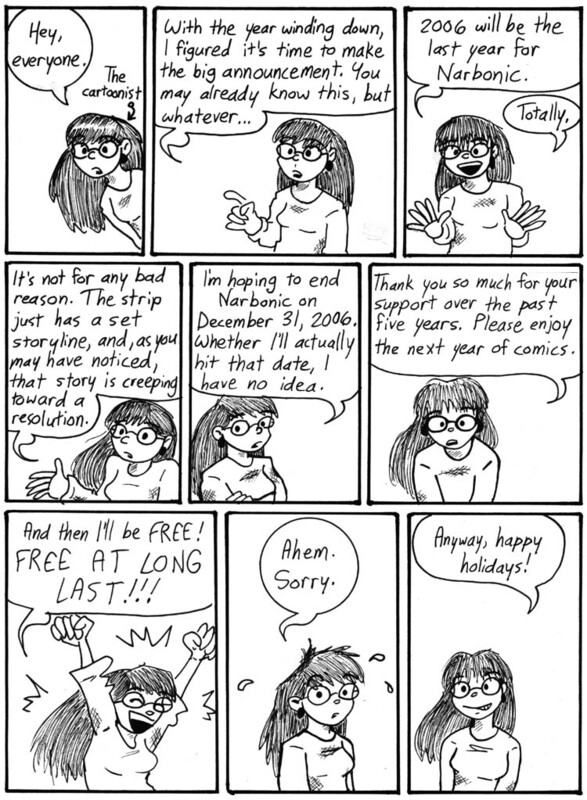 Okay, wow… I’d been open for a while about my intention to end Narbonic, so this announcement wasn’t a huge surprise, but it’s the first time I posted anything about it on the site itself. As with pretty much any Sunday strip that’s just me talking, I drew it quickly. But with heart. So. Last year of Narbonic. Better work up some good commentary. Meanwhile, Valerie Kaplan, creator of many paper doll outfits, has been kind enough to make Victorian clothes for Artie, based on a sketch I did for her Narbonic Perfect Collection Kickstarter pledge last year. Artie never makes an appearance in the Victorian strips, but if he did, this is what he’d wear. I mean, look at the walking stick. Thank you, Valerie! Speaking of which, tangentially, the Skin Horse Volume 3 Kickstarter drive ends on May 31. Which is soon! Oh, the Victorian Artie sketch wasn’t my Kickstarter sketch! Mine was ANTONIO SMITH, FORENSIC LINGUIST rope-swinging. The Artie sketch was one of the samples posted on whichever Sunday that was. Not a lot of difference between the full-colour and sepia versions on this one. Also, hats are hard. Oh my. Well, you started again— with Skin Horse! I remember a time when the events described in this missive were in the future… but just barely. No, I’d always loved Narbonic! It just had an ending. And I did need a break after six years of drawing it. That was one of my major reasons for tricking Jeff into co-writing Skin Horse with me; after Narbonic, I said I’d never do another daily webstrip unless I could get someone to help.